Meet up for drinks at our retro-chic lounge which embodies life on the Strip. 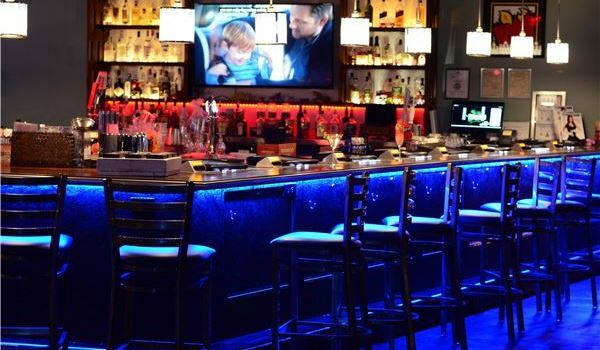 Let our experienced mixologists start the night off with top shelf drinks, signature cocktails and select beers on tap. Order a classic margherita pizza, grilled panini, shrimp quesadilla, spicy chili burger or fries and start a game of pool. Then sip drinks at the bar or head out to our patio to relax by the fire pit under the lights of Las Vegas. Wake up to a classic breakfast or enjoy lunch and dinner fare like pizza and sandwiches at our swank restaurant bar. The Lounge's "beat the clock"-style Happy Hour $3 in the 3 o'clock hour, $4 in the 4 o'clock hour, $5 in the 5 o'clock hour and $6 in the 6 o'clock hour daily with specials on select domestic draft beer, well cocktails and house wines by the glass.